This section covers configuration settings for PowerPrecision Console (PPC) on the server and client. In the Admin View, click on the Server Settings tab. The server address is displayed. The store location can be edited to enter in location identification. In the Admin View, navigate to the Client Settings tab. These are global settings to configure PPC Client behavior. Automatic EOL – When enabled, the EOL request is automatically sent to the PPC client when the battery reaches the specified End of Life Threshold values. Data Collection Triggers - Determines what device information is collected and when to send the information to the server. Select the desired events to trigger data collection on the device and the amount of time elapsed in between each trigger event. When an event is triggered, it is logged in the device history. The minimal time period that can be selected is 1 hour. EOL Alerts - When enabled, sends an EOL alert notifying the user to prepare for battery decommissioning based on the time trigger options: Show Alert On Next Boot, Show Alert On Next Battery Swap, Show Alert At [specified time]. Create additional users to access the server. After logging in as the administrator, click on the admin name at the top right of the Admin View and select Manage Users. Click on the Action button. Click OK when the confirmation message appears. Threshold Value in PPC and Battery Manager - Battery Manager is a built-in application with the “Percentage decommission threshold” set to 90% by default. This is the same default value for “End of Life Threshold” on PPC. 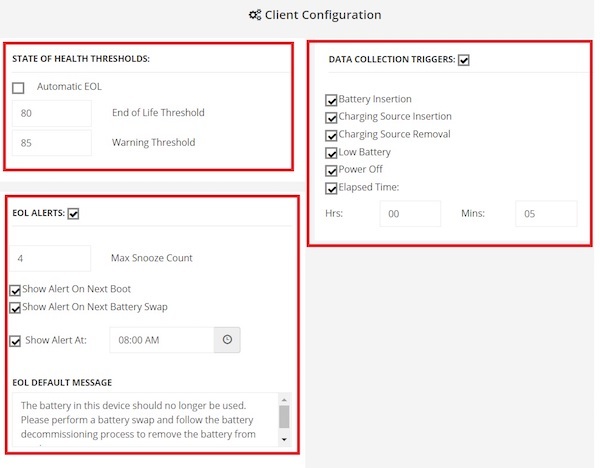 To avoid multiple warning notifications being sent to the end-user with the same message when the battery reaches the percent threshold, we recommend the admin to set the “Percentage Decommission Threshold” value in Battery Manager to 5% less than the “End of Life Threshold” value set on the PPC server. This can be accomplished using an EMM such as StageNow or Zebra's Battery Manager CSP.